Given the extremely sensitive nature of the spin processor to any chemicals entering its vacuum path, there is a specific procedure to use the machine. The chucks will be kept by the staff only and given to the user on demand. Upon return of the chuck, the spin processor will be inspected by the microfab staff and checked for cleanliness. If a user left the machine is in a non acceptable state, he or she will be suspended from cleanroom access for 2 weeks. relevant MSDS for used chemicals : Shipley S1800 series, AZ9465, SU-8, PMMA. Laurell spin processor located in the Photolithography room. through regular training before using this equipment alone. The processor is meant to coat wafer/sample and also to dry masks/wafers (4" and 6") using a non contact spinning chuck. Thus, the masks/wafers are not held by vacuum but by mechanical pads. Be sure to carefully and properly place the mask/wafer on the chuck so that it does not break loose and shatter during spin drying. NEVER flood or spray solvents such as acetone or any chemical cleaner on the keypad surface. NEVER flow or spray any chemical in the vacuum path. This will very likely damage the vacuum sensor, seals, motors and electronics. When using the adapter for small pieces, only one of the top o'ring should be used. The inside o'ring is for pieces >11x11mm2. The outside o'ring is for pieces >20x20mm2. Warning: sample smaller than 11x11mm2 should be taped to a larger substrate to prevent resist to overflow and go in the vacuum path. ALWAYS check the spin coater has been left clean by previous user. If not report to fab manager. Prepare the needed amount of resist in a disposable cup (aluminum or plastic) and prepare a disposable pipette for dispense; alternatively use an amber bottle with a pipette. Choose the program by pressing the PROGRAM SELECT button (see program list below for information). Programming instruction are described below. 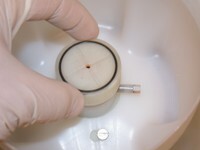 Place your sample on the chuck being sure the oring is completely covered. Remove the chuck and the liner and clean them with a rag and acetone at the litho wetbench. The chucks are screwed onto the shaft. Hold the shaft steady using the little horizontal bar as shown and screw in the chuck. Tighten it gently. location of the guide pins in relation to the wafer flats. wafers or masks may fly off and damage the substrate itself and the equipment. A program is made of several steps (max: 51). Each step has 3 parameters: time [min:sec], speed [rpm] and acceleration [rpm/s]. Place the unit in programming mode by pressing the F1 key: PGM will appear on display. Select program letter to be modifed using PROGRAM SELECT key. Spin drying chucks are NOT made to exceed 3000rpm.